A new inexpensive prototype device provides non invasive and instant diagnosis of brain injury to determine if the brain is swelling or if it is bleeding.The device can be combined with a cell phone for remote diagnosis according to a new study from University of California, Berkeley. A research team led by Boris Rubinsky, Professor of the Graduate School at UC Berkeley’s Department of Mechanical Engineering and César A. Gonzáleza professor in Mexico at the Instituto Politécnico Nacional, Escuela Superior de Medicina (National Polytechnic Institute’s Superior School of Medicine) has developed a new technology using wireless signal that could transform brain injury diagnostics. A prototype was tested in a pilot study involving healthy adults, and patients with brain damage. 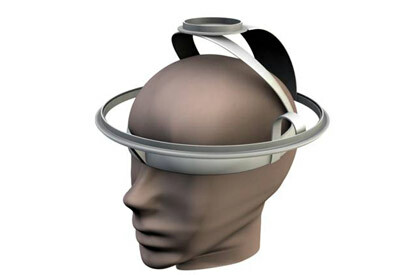 The engineers fashioned an helmet-like device that was broadcasting electromagnetic signals through the brain. Based on the signal received the researchers were able to identify which patient was suffering from a brain injury and which patient was healthy. Signals were able to differentiate brain edemas, for which swelling results from an increase in fluid in the tissue, from brain hematomas, which are internal bleeding causing the buildup of blood in certain regions of the brain. Diagnosis obtained with the inexpensive device matched results obtained from CT scans.